Tuesday during lunch I finally finished Aidan’s booty “shoes” which only needed to be seamed and laced. 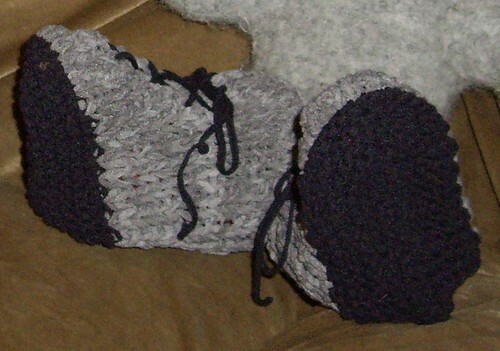 I began using the Uggs Baby Booty pattern on the “Oh Baby!” Knitty Gritty episode, but I ended up revamping the entire pattern and making it my own. They were part of my “Show and Tell” Tuesday night in Fabric Place (I accidentally left the 2 pairs of Blizzard mittens in the car!). I hope you like them. 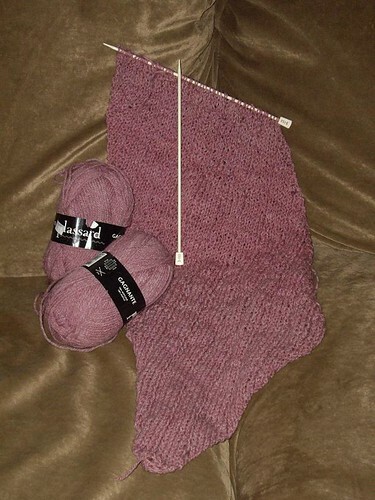 My plan is to change the pattern from a 2-needle to a DPN/circular one. Your bunner’s booties/uggboots are adorable. I like the bunner too. Did you knit him. 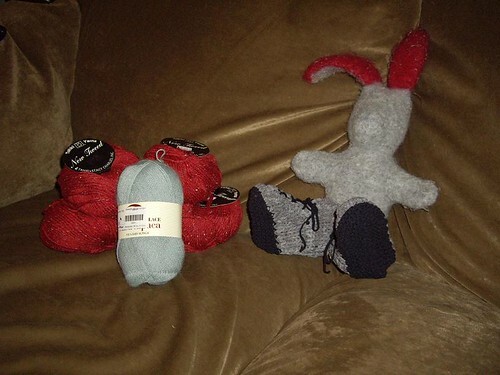 Gee…I wonder if Gretchen would like some booties? Cute shoes and bunny. You have been productive! Cute booties. And I must say Kudos on the Clapotis. I gotta knit me one of these (yeah I just keep saying that). Cute booties! That’s a great package you sent! I have Clapotis envy! I absolutely love that design. You amaze me that you have made 8!!! Keep up all the good work, and kiss those bunnies for me!